Get started with your account and studying your course in no time! As a new student to the platform you will be invited to the campus by your Course Facilitator to begin studying the designated course. It is very simple to get your account set up so you can get started with studying your course! You will receive an email inviting you to the course. The email will include details for the (1) Course you have been invited to study, a (2) link to the login page for you to easily bookmark for future access, a (3) link to the password recovery page should you have trouble accessing in future and the (4) email address of the Facilitator that has invited you to the course. 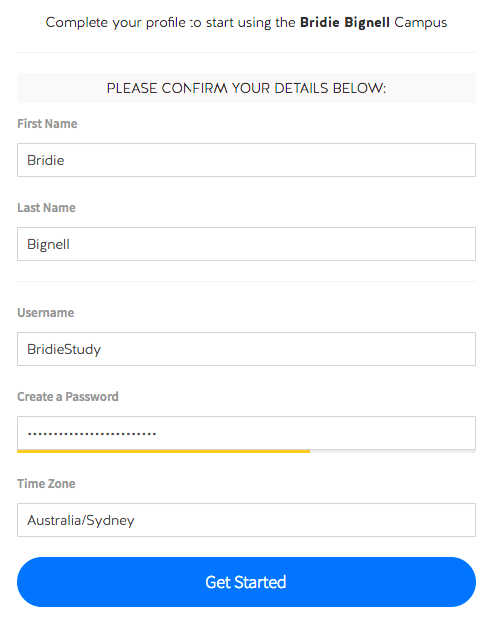 Fill in your First and Last name, the Username you prefer for easier access to your account, Create a password and select the Time Zone from which you are studying. Click Get Started when you're ready to proceed. Your account will have now been activated successfully, click Continue. From here you will be able to view the courses you are enrolled and click Start on your preferred course to start studying!